From 11 to 15 December 1972 a group of historians from many European countries assembled in Groningen to commemorate the centenary of Johan Huizinga's birth in that city on 7 December 1872. The conference was not intended simply as a tribute to the memory of a great historian but also as an attempt to assess the sig­ nificance of his work for the present generation. It was supported by generous grants from the Stichting oud-studentenfonds van 1906 at Groningen, the Gro­ ninger Universiteitsfonds, and the Ministry of Education and Science. We are pleased to be able to publish all the papers read at the conference, together with Dr. Jansonius's study of Huizinga's style, written for another occasion. The material is presented in a roughly chronological order. The first three papers, which examine Huizinga's intellectual and literary points of departure, are followed by another three dealing with The Waning of the Middle Ages. A special paper is de­ voted to Huizinga's Erasmian studies. The next three authors investigate the prob­ lems which preoccupied Huizinga during the 1930s. Three final papers examine general aspects of his work. 1. Johan Huizinga 1872-1972. 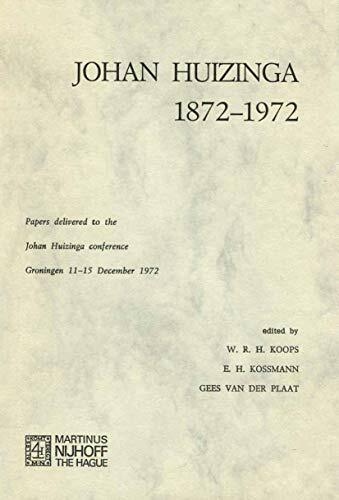 Papers delivered to the Johan Huizinga conference, Groningen 11-15 December 1972.